The Center for Italian Modern Art is excited to announce its third season, dedicated to Giorgio Morandi (1890-1964), one of the best known Italian artists of the 20th century. 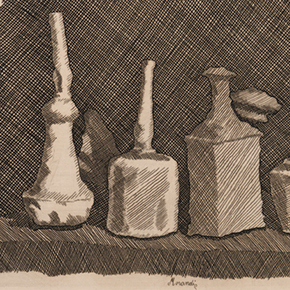 The exhibition focuses on the artist’s rarely seen works from the 1930s—the decade when Morandi reached full artistic maturity and developed his distinctive pictorial language. These works until now have remained relatively little known or exhibited outside of Italy. Featuring circa 40 paintings, etchings, and drawings by the acclaimed Italian modernist, the installation marks the first time in decades that many of these works have been on view in the US. CIMA’s show draws from major international public and private collections, including those of the MART Museo di arte moderna e contemporanea di Trento e Rovereto; the MAMBo, Museo d’Arte Moderna di Bologna; the Peggy Guggenheim Museum, Venice; and the Kunstmuseum Winterthur in Switzerland. The installation also presents select works from the very beginning of Giorgio Morandi’s career in the 1910s and from the very end of his life in the 1960s, to illustrate the thematic and pictorial continuities in the artist’s research. It also includes a selection of contemporary works inspired by Giorgio Morandi’s practice by artists Tacita Dean,Wolfgang Laib, Joel Meyerowitz, and Matthias Schaller. The Center for Italian Modern Art (CIMA) is a 501c3 nonprofit exhibition and research center established in 2013 in New York City to promote public appreciation and advance the study of modern and contemporary Italian art in the United States and internationally. Each academic year CIMA presents in its spacious loft in SoHo an installation examining the work of modern Italian artists rarely exhibited in the U.S. These installations bring the art of inspiring masters into dialogue with contemporary artists, illustrating its impact and ongoing resonance today. The exhibitions serve as the theme for CIMA’s fellowship program, which aims to promote new scholarship and dialogue in the field through the support of emerging young scholars from around the world. CIMA is open for visits to its exhibition on Fridays and Saturdays at 11am, 1pm, 3pm, and 5pm, and holds special tours, events, conversations, and study days as part of its programming.